Gareth Bale wants to "play all his career" at Real Madrid despite the return of Zinedine Zidane as manager, says his agent Jonathan Barnett. 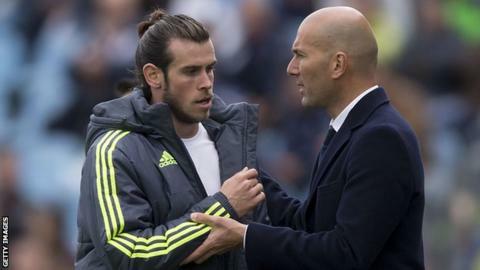 The Frenchman's appointment is "bad news" for the Welsh forward because Zidane "does not want to work with Bale", according to Spanish football expert Guillem Balague. Barnett said Bale is "very happy at the moment" but "we will see what goes on". Asked if Bale will stay at Real, Barnett replied: "Yes, why not? He wants to play all his career for Real Madrid and if it does not work out, we will talk again. You can listen to the full interview on BBC Radio 5 Live's Football Daily podcast. After scoring twice and beating Liverpool in last season's Champions League final, Bale said he was considering his future having been named as a substitute for the match. Bale was not a regular under Santiago Solari either, who was sacked on Monday after replacing Julen Lopetegui in November, while sections of the Bernabeu crowd jeered the Wales forward when he was substituted during the 1-0 El Clasico defeat by Barcelona earlier this month. Barnett said: "We speak a lot. The closest person to him is my son Joshua who is really his agent and he looks after him, he has done a good job. "Gareth wanted to play one way and Zidane wanted to play another. That was the cause of it and over a period of time it got worse. Bale's record at Real is superb, winning four Champions League titles, one La Liga, one Copa del Rey and three Uefa Super Cups and Club World Cups. He has scored 101 goals for the Spanish side but has reportedly been nicknamed 'The Golfer' by his team-mates, and goalkeeper Thibaut Courtois also said Bale did not attend a team meal because he did not want to miss his bed time. Barnett said: "Bale is a very quiet man, he has been accused of some terrible crimes like not wanting to stay out until 1am. That is terrible and every paper said that was disgusting. Can you imagine the reaction of the papers here if they saw an English player out at 1am? "He loves to be fit, he has a regime and he sticks to it. He is the perfect pro. "He is very friendly with everyone, they know what he does and playing golf on a day off is not a crime. If anybody from the club wants to play he is available. He is fine, loves life in Madrid and has always been happy. It is very unfair of the press. "I assure you Gareth does not read the papers about himself. The press are wrong to behave like that, it incites the fans. "I also have a big gripe with the British press in that he is one of, if not the best, export that has ever left Britain to play abroad, one of the best players Britain has ever produced and unbelievably, even the newspapers in England don't stop knocking him. Bale's move to Madrid in September 2013 for £85m was a world-record deal at the time and Barnett spoke about having to deal with Tottenham's tough negotiator, chairman Daniel Levy. "It was the most rewarding and most exciting deal," he said. "I was breaking the world transfer record and everything was exciting around it. There have been harder ones. "Daniel Levy kept his word. We had a long conversation and he said if we get to a certain point I will let him go. Gareth behaved himself, he never asked to leave or for a transfer and took it as we told him to and it worked out. "I have done a lot of negotiating with Levy - he is hard, but he speaks the truth. When you shake his hand, the deal is done. I would rather deal with somebody who you fight with but is straight. "I am one of the hardest men for negotiating for my clients. I would hate to think any of my players are underpaid, hopefully they are all overpaid. "I have big respect for Levy. There are a lot of chairmen around who are easy to deal with until it comes to signing and then it is completely different." Calculations from June 2018 showed that the Premier League was the market leader for revenue generated, having brought in £4.5bn, and the English top flight is 86% larger in terms of revenue than its nearest competitor, Spain's La Liga. But because of a lack of first-team chances, English youngsters such as Jadon Sancho, now at Borussia Dortmund, and Reiss Nelson, on loan at Hoffenheim have moved away for more opportunities. Barnett said: "The Premier League is the number one league in the world. You can see it now. Most players that I know want to play in the Premier League. It is the same with the coaches, they want to coach in England. "These foreign leagues cannot compete, they have changed their tactics completely. They cannot buy or pay the wages of the superstars so are going to youth. "They are coming to get the best young players around the world. That means coming to England so that is a whole new way for the foreign clubs. "Big clubs in Europe are offering young players incredible deals. I just did a deal with a player, one of the best midfield youth players in the world. It was not in England, the club said they have a policy on youth, so I said he has to go somewhere else. Three weeks later, they smashed their salary record by £5m. "They cannot compete and players see they will probably get pushed forward more than in England, like Sancho. They will play at the higher level early on."